If you are missing one or more teeth, you could do worse than replacing them with dental implants in Burlington. Actually, that’s an understatement; dental implants are the very best tooth replacement currently available. They promote better oral and overall health, free you from the stress and discomfort of an ill-fitting denture, and provide a whole host of other benefits. Here are the top four things you need to know before deciding on dental implants. Dental implants are not completed overnight. In some cases, the whole process can take up to a year. 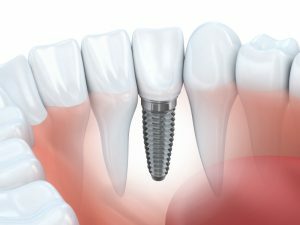 Each implant is surgically placed and then allowed to heal over a period of three to six months, or the average time it takes for the dental implants to fuse with the bone tissue. Once this process, known as osseointegration, is complete, you return to our office where Dr. Kostas or attaches your prosthetic (the crown, bridge, or denture) on top of the dental implant(s). While it is true that other tooth replacement options, like a fixed bridge or non-implant supported denture, are completed more quickly than dental implants, it’s absolutely worth the wait for comprehensive tooth replacement. When you have lost a tooth, you are not just missing its crown, or the visible portion. Replacing the root is crucial for providing superior strength for the replacement teeth. Aside from unsurpassed stability for the tooth replacement, osseointegration also provides the jawbone with the stimulation it needs to stay healthy for years and years. The only way to know for sure whether or not you are eligible for implant dentistry is to schedule an appointment at Complete Dental Care. Your implant dentist will evaluate your oral and overall health to determine whether or not you are fit for the dental implant procedure. Patients who have lived with missing teeth for an extended period of time may have already experienced significant jawbone degeneration, which may require bone augmentation procedures (like sinus lift) to build up the bone structure for successful anchoring of dental implants. Oftentimes, a dental office is equipped to perform only the second portion of the dental implant procedure, or the restoration. But at Complete Dental Care, there is no need to worry about finding an outside referral. Dr. Kostas handles dental implant placement, and both Dr. Kostas and can take care of dental implant restoration. Increase convenience and enjoy better results when you entrust your dental implants to Complete Dental Care. Find out if you are eligible for dental implants by visiting the experts at Complete Dental Care. We can’t wait to discuss how we can help you enjoy a complete, beautiful smile once again! Request an appointment today.